Have you given a thought to summer camping yet? Those yurts, lodges and cool glampy sites get booked up waaaaay in advance, so to give you the early heads up, here are the 25 best places to start your search, as chosen by the people in the know – the regional Muddy editors. I love glamping. The great outdoors. Looking up at the stars. Camping without arguments over who will put up the tent. This plce doesn’t have all guns blazing, there is no electricity and you don’t get hair straighteners in the shower block á la Soho Farmhouse but you do get to choose the colour of your bell tent (coral red, apple green, sky blue, sandstone, rainbow, circus or cookies and cream), they are fully kitted out with cosy furniture, kitchen boxes and the obligatory fairy lights, and upgrades for 2017 include eco-fueled heaters and BBQ starter kits with marshmallows. Plus, it’s a mere pebble’s toss from all the stone circles, white horses and stunning scenery you can shake a stick at. Only upscale glamping here – luxury canvas lodges with…wait for it…your OWN shower, the UK’s first two-storey tent and, due for completion this month, a fantabulous tree house! King Arthur’s Willow nestles beautifully next to the stream in Bottom Water Meadow with amazing panoramic views, three bedrooms, a living room and stylish kitchen for socialising. It’s even got a whirlpool path. Jeez, how camping has changed. The kids’ll love it too, with Farmer Joe all set to take them on a farm tour and say hello to the lovely ducks, cattle and donkeys. 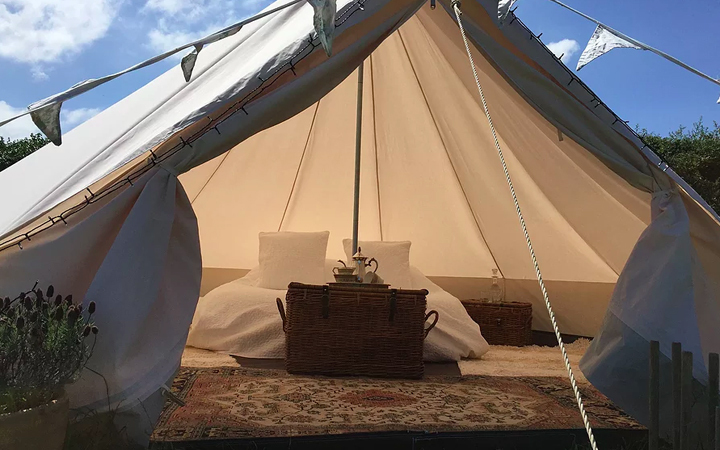 If you love the idea of getting back to basics, but can’t quite bring yourself to sleep on a deflating air mattress, pitch up at Hollington Park Glamping near Newbury. 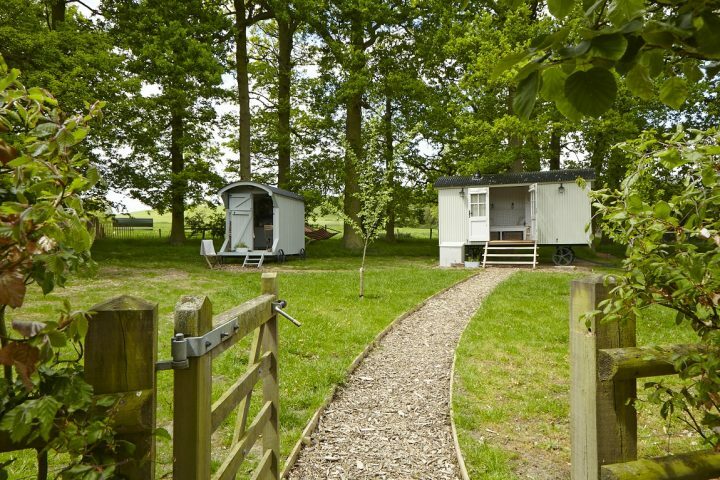 In the shadow of Highclere Castle, it’s a small-scale site with just two insulated wooden pods with cosy double beds. Now you’re talking. Enjoy your woodland surroundings from the deck or get all social round the firepit or covered seated area. You can even order a breakfast hamper, full of local goodies form the owner Claire. I’d probably resist the urge to play guitar, but that’s just me. Prices start at £70 a night. I have a two-night limit on camping. But Glampotel in Cookham, nr Maidenhead, is my kind of sleeping under the stars. This two-tent hideout is in the gardens of the Sanctum On The Green boutique hotel. You sleep in a king-size bed, have access to a heated pool, spa and a hotel breakfast. Basically it’s a canvas bedroom. But but but, it is romantic, luxurious and a camping trip to enjoy with the kids. A tent costs £150 per night. Chandeliers with your bell tent and farm views? Hello Home Farm! 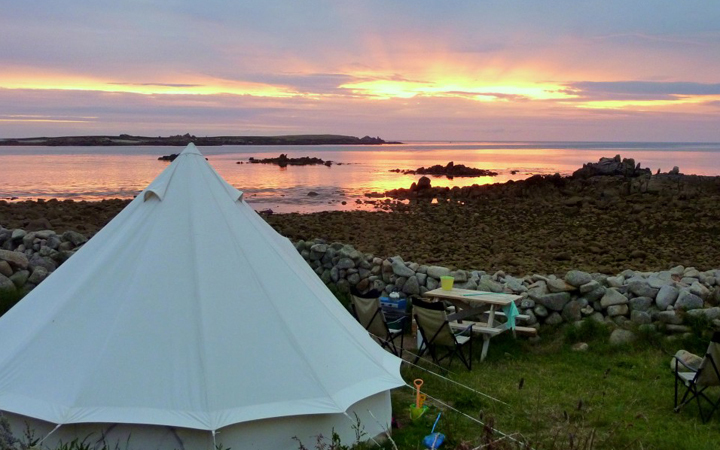 These glamping bell tents are not for the hardy camper (so perfect for the likes of me). We’re talking real double bed mattresses, single mattresses & futons, rugs, dining and cooking equipment, a wood burning stove inside, plus an Indian Kadai firepit and BBQ for cooking. If you crave a good pub meal, The Crown at Radnage is just next door, and the recently reviewed Three Horseshoes is a few minutes down the road too. Needless to say up so high in the Chilterns, the views around here are jaw-dropping, you’re just far enough from the hustle of the nearby towns to feel wonderfully remote. Set in a unique riverside location near Marlow, there are 12 acres of beautiful water meadows in which to camp in tents (or basic bunks if you really have an aversion to canvas). Alternatively hunker down on Taylor Island (Longridge’s own island, popular with Cubs) for the ultimate swallows and amazons experience. You can the kids busy with watersports in the day while you supervise with a stiff drink. Blue Bell is a beautifully restored 1971 ‘VW early bay’ campervan, comfortably sleeping 2 adults and 2 kids in Knapwell near Cambourne. Transform yourself back to flares and Mungo Jerry in a van that still retains her original 44-year old interior. She’s been airbrushed a little you’ll be relieved to hear – newly reupholstered seats, cd/DVD player and an electric hook-up has brought her close to the 21st century but nothing that’s going to ruin her integrity. She comes with a sun canopy, chairs, table and cooking, eating and cooling equipment. An optional awning, trailer and bike rack are also available. 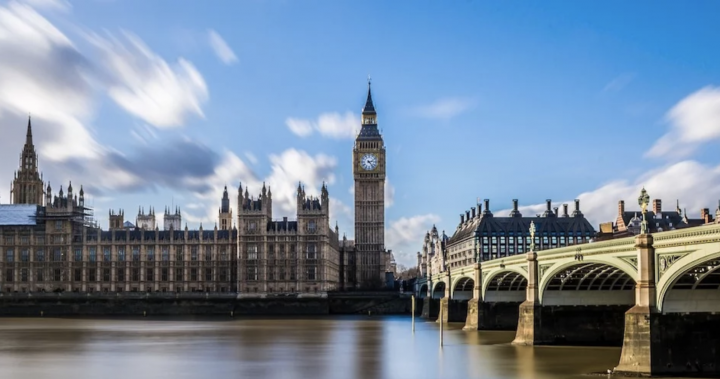 A perfect weekend escape and if you’re thinking of hitting any of the summer festivals that are fast approaching you’ll be rocking the retro vibe big time. Hot pants and wellies not included. Sheepskin rugs, Egyptian cotton sheets and super-stylish touches in a meadow overlooking the ocean. I’m in heaven! Soul Camping does eco and off-grid but makes it all so easy and comfortable – a brilliant option for reluctant campers or a totally fuss-free holiday under canvas. Look out to sea while snuggled in your king size bed, watch the sun go down from the hot tub or take a twenty-minute stroll to the gorgeous village of Port Isaac for some of the best seafood around. Every pitch has its own fire pit with a tripod for cooking (very Bear Grylls) as well as your own private loo (the luxury!). Run by a Mum of four, children are well catered for. Let Leah know the children’s ages and she can organise everything from high chairs and travel cots to a dressing up box. Already chocka during the summer holidays, this is a site you need to book up early and it’s no surprise. Troytown Farm, on the remote island of St Agnes, is right on the beach with views of the water you’ll never tire of. Peaceful doesn’t cut it, St Agnes is the farthest flung of all the Scilly Isles, with the epic ocean sunsets and crystal clear night skies to match. 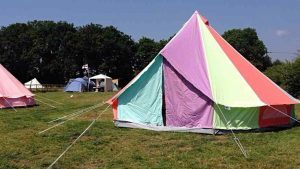 If you have your own kit, this can be delivered to your pitch off the ferry and boat from St Marys or there are bell tents to hire, fully equipped with all the camping necessities (but again, think comfortable camping not glamping). Troytown Farm is the only dairy farm on the Isles of Scilly and you can buy their own milk, butter, clotted cream and legendary ice cream in the site shop. A boutique hotel with canvas sides (and a flipping Chesterfield sofa!) is how the five luxe safari lodges at this idyllic little spot have been described. In a secret valley overlooking the North Devon Coast, just 20 minutes’ drive from what is officially the Best Beach in Britain, you’re sort of on to a winner already and that’s before you’ve even clapped eyes on your digs. Each lodge sleeps up to six plus two dogs and comes fully equipped with everything you could possibly need, from firewood to fizz, coffee to conditioner, lemons to loo roll. The idea of snuggling down under the White Company linen, while the wood burning stove kicks out toasty warmth, listening to a babbling stream – even rain pattering on the canvas – is hugely appealing. 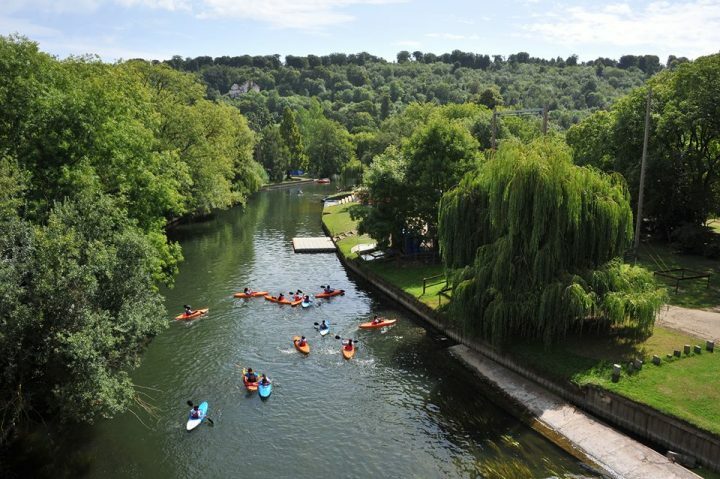 And since you’ll wake free of that horrible gritty-eyed feeling that normally comes with camping, you’ll want to go out and explore the seventeen acres on your doorstep, which includes a well-stocked boating lake for fishing and boats named Oxford and Cambridge for boat races. If only somebody else would offer to do the cooking and they’d be on to a winner. Oh wait… ok, sign me up. One thing you won’t need to pack is a mirror. Have you seen this great big shiny beast? If Don Draper did camping, this would be his pad of choice. Built in 1956 and once owned by a member of Wally Byam’s Caravanners Club (the founder of Airstream trailers, since you asked), there are still stickers on the windows from 1961. 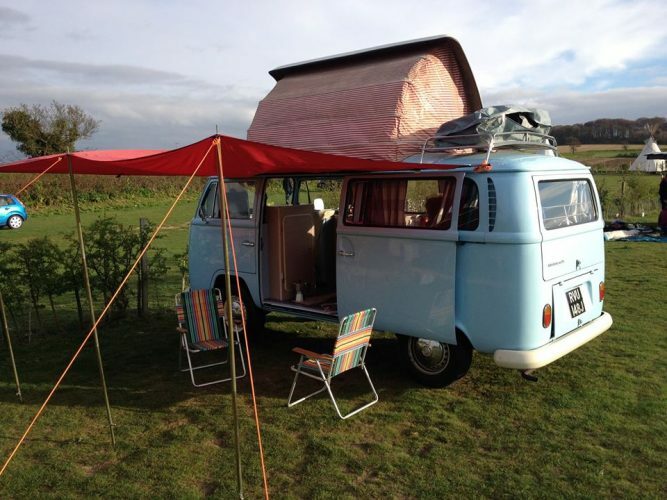 It might look retro, but there ain’t nothing old-school about the mod-cons inside. For all the vintage charm, this little beauty, which sleeps two, has been restored to 21st century standards. Egyptian cotton, walnut kitchen with dishwasher (there is a camping God), sound system and flatscreen tv, power shower, underfloor heating, air conditioning, you name it, it’s all in there. Oh, and the pub in the gorgeous riverside village of Dittisham is only a mile away. Now, if only Don Draper were inside, naked and…oh, sorry, I said that out loud, didn’t I? 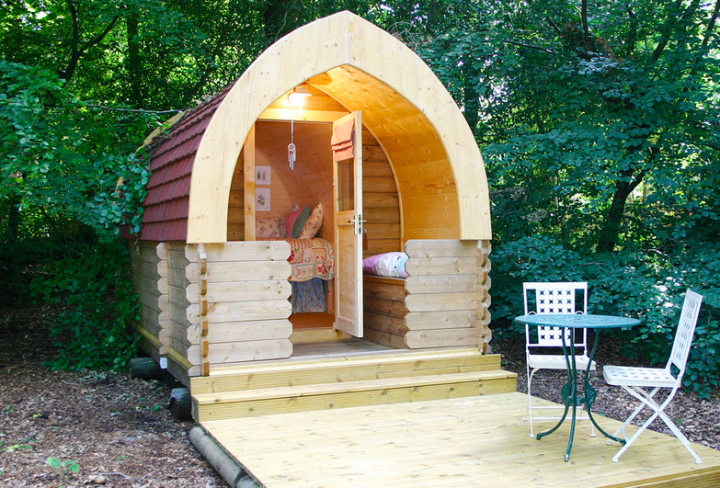 Glamping, orchard – loving the sound of this already. Offering a back-to-nature without the back-to basics experience, this idyllic spot in the Severn Vale, five miles from Gloucester and just a short walk from the River Severn, is perfect for families, as well as couples with romance on their minds. 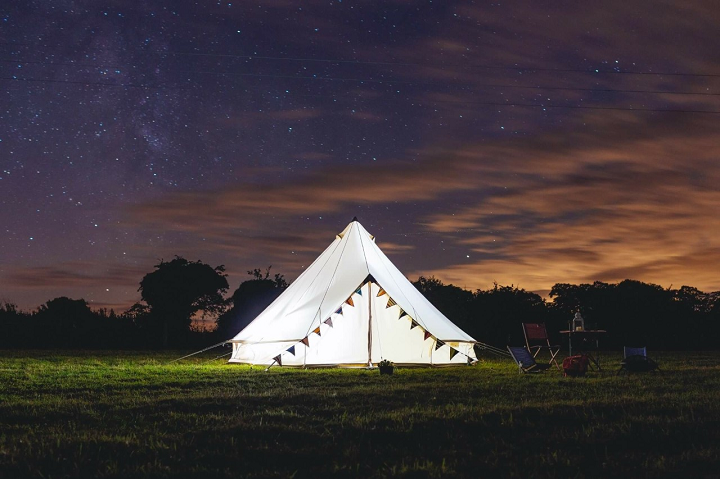 There are two luxury camping options – Belle, a cosy bell tent that sleeps five and The Warwick Knight, a restored 1950s caravan for a family of four. The former, an elegant, cream, 5m by 3m cotton canvas affair, brings to mind a Victorian colonial adventure and is suitably furnished inside with wood-burning stove, rugs, cushions, double bed and atmospheric Moroccan touches. There’s a fire pit that doubles up as a BBQ, a separate private kitchen hut with gas stove and grill, and a private bathroom with wood-fired shower. The Warwick Knight, meanwhile, thought to be one of only three ‘Rolls-Royces of caravans’ left in the world, takes camping to the next level with its fully equipped kitchen, sitting area with log burner and stereo system, and separate sleeping areas with double bed and bunk pods for the kids. Is it actually camping? Well, yes, if camping is about being close to nature. And where better to enjoy the bucolic setting than from the caravan’s standout feature – an elaborate roof garden that wowed visitors at the 1952 Earls Court exhibition. Sink into a beanbag, drink in the view of the Severn and wait for the stars to come out. Bliss. 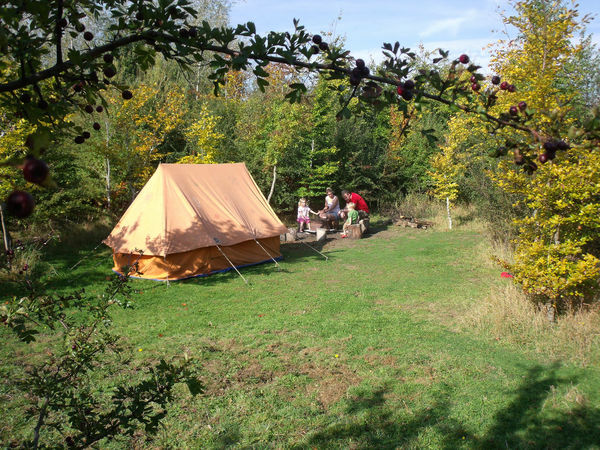 This earthy, ‘leave-no-trace’, family campsite is The Good Life taken out of Surbiton and properly planted in a 1,500-acre organic farm near Cirencester. Inspired by a passion for organic living, the farm and campsite perfectly encapsulate the owners’ green vision, and boy is it infectious – environmental epiphanies are part of the experience. There are multiple options for pitching your tent: in the vehicle-free Green Field; in the Magical Open Glade, a secret spot in a young wood that takes just eight campers; in the Special Occasions Field, a small private campsite for up to 50, with amplified music by arrangement (mini festival anyone?). For the tent phobic, the last also has a shepherd’s hut for two and elsewhere on the farm there is a Single Yurt in a woodland glade for five and a 4 Yurt Eco-Camp for up to 18 people located on the edge of a wood. A farm shop is full to bursting with incredible produce – eggs, milk, cheese, meat, fruit, veg, beauty products – so definitely don’t do a supermarket shop before you arrive. There’s also a licensed, veggie café which serves a vegan dish every day and ‘meat as a treat’ traditional roasts on a Sunday (with the meat sourced from the farm, of course). If you’re coming with kids, sign up for the Family Camp option which includes an incredible range of activities for young ‘uns from collecting eggs from the chickens and digging up carrots in the field to nature games in the woods, dusk walks to see wild badgers and stories around the campfire to the sound of twit-twooing owls. 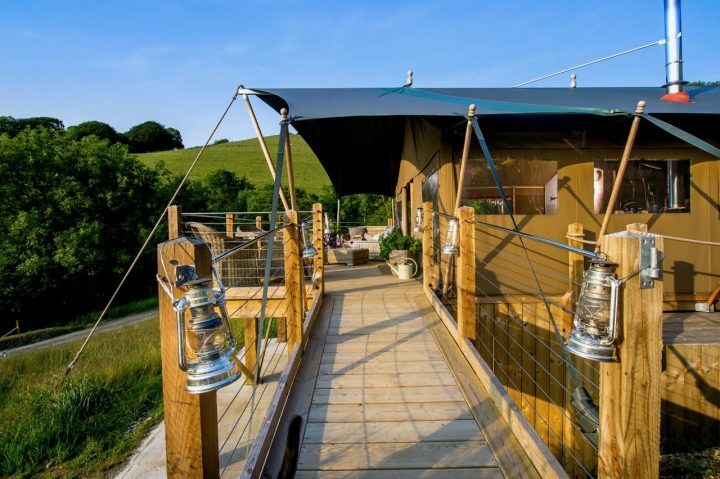 I’ve only just discovered Home Farm Glamping, which is so far south in the county, it’s practically in London. Yet just look at the location. It’s got Aldenham Country Park on one side and its very own river for fishing on the other. Designed with a nod to those of us who panic when our iPhone is running out of juice, this is the kind of glamping where those minor details have been thought through. 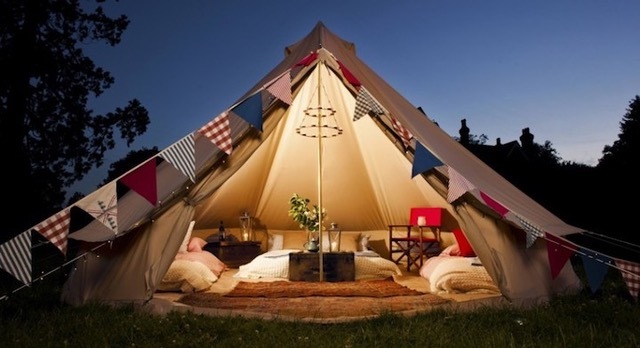 It’s an outdoor sleepover but with all kinds of bell tents and whistles. Snuggle down. 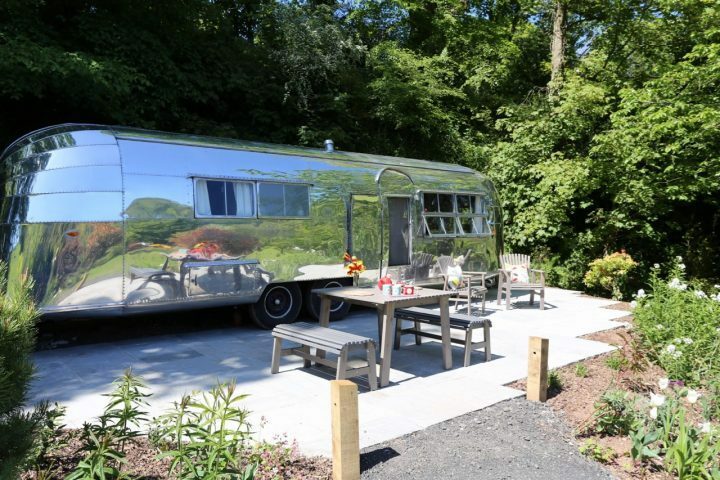 Like a knight in shining armour, in gallops this quirky, luxe camping option from Leeds Castle. 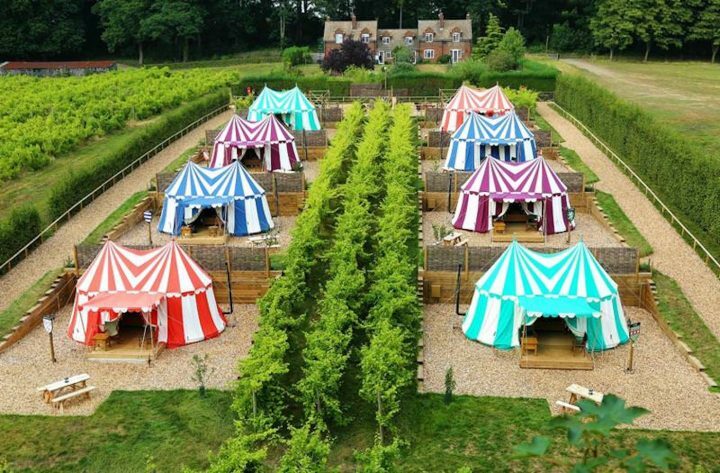 The striped pavilion tents sit in a picturesque, disused vineyard within the castle grounds. A garden path leads to a Chesterfield-furnished living room and the Great British Kitchen at the Fairfax Restaurant, which serves gourmet meals while you enjoy the scenic view. Explore the castle and all the many activities on offer by day and by night, cook on a cast iron griddle over an open fire pit and under the stars, then snuggle up in your grand four-poster bed, under furry rugs and beside a log burning stove. Ooh, you’re so Medieval. 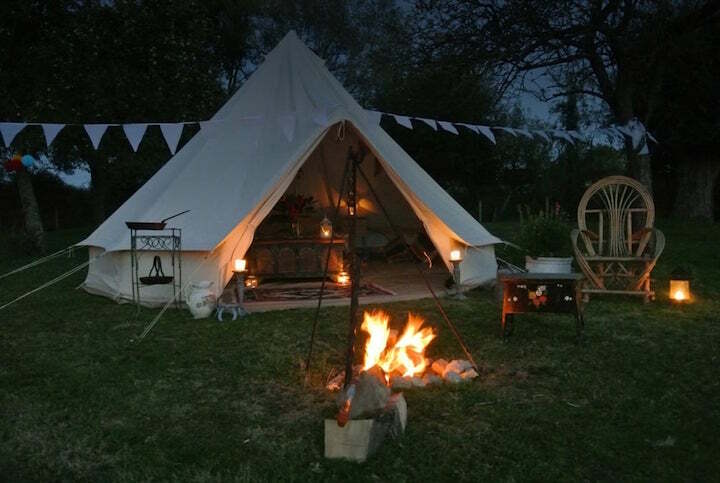 A glamping stay guarantees free access to Leeds Castle and grounds for your entire stay. 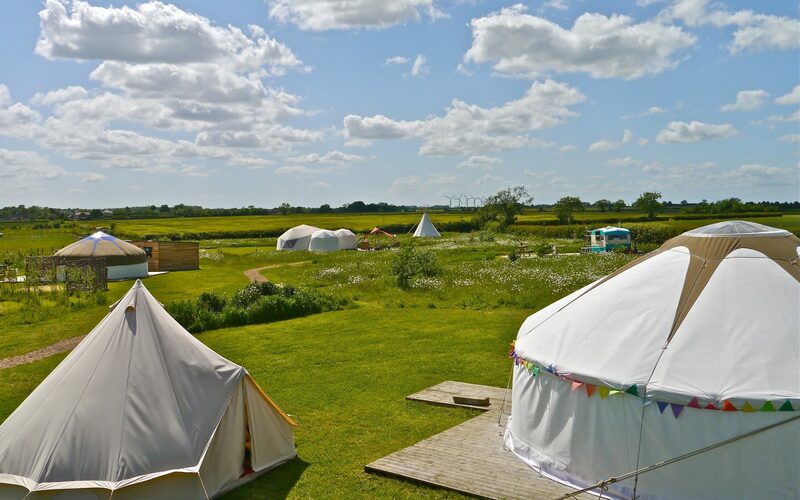 2posh2pitch isn’t just a great name for a glamping company, it’s a family-run business that’s as stylish as the bell tents it hires out all over the beautiful North Norfolk Coast. The company has four sites to choose from – Whitehall Farm, The Fire Pit, Blue Skies and, new for last year, Burnham Breck (a five-minute walk from Burnham Market) – each within easy reach of the beautiful beaches of Wells-next-the-Sea and Holkham, as well as woodland walks. The floor of each five-metre bell tent is covered in soft, colourful rugs, while furniture includes a wooden table, four single air beds with fitted sheets, plus a charged air bed pump, two lanterns and a torch. Spend the day cycling, walking or pub lunching; come evening light the BBQ, get the wine out and marvel at those beautiful Norfolk skies (and stars). New for this year are dedicated hen camps at Burnham Thorpe and Burnham Breck, with dressing rooms containing long mirrors, solar power for hair dryers, 4G for mobiles, Bollywood themed nights, a fridge, a Prosecco bar (or coffee and cheese toasties), and bacon butties and coffee delivered by the local café the next morning. Warm summers evenings soaking in the hot tub, sausages sizzling on the BBQ while watching the young lambs prance around and the cows show how a true family hierarchy can work. Yup, that’s what you’ll be doing when you get away to Jubilee Barn in the hamlet of Astwell, Northamptonshire. 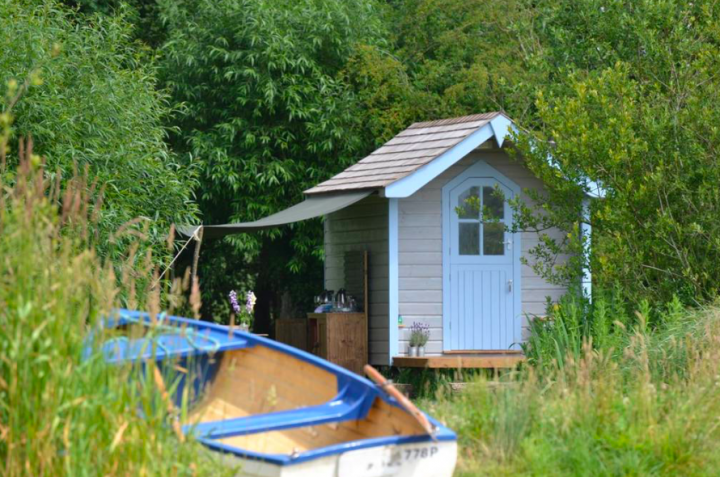 A smallholding with a boutique Yurt for a luxurious escape, it’s more than just glamping! There’s an eco bathroom with hot and cold running water, and did I mention the hot tub? Sip Prosecco on balmy summer evenings and soak up the quietness with your special someone (and the kids if you prefer a noisier affair, the yurt sleeps 4). Perfectly placed in the idyllic countryside of Helmdon there is adventure in every direction. 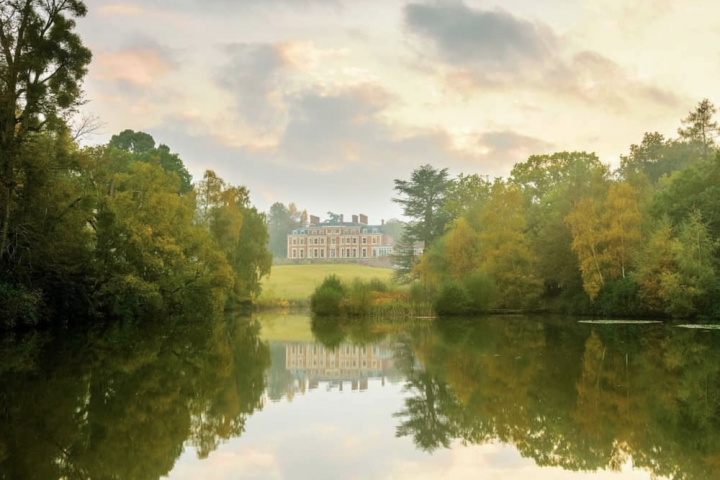 From an experience at Silverstone to punting in Oxford, to fishing on the owner’s lakes or horseback riding from nearby stables, there are endless possibilities. Take a stroll down one of the winding lanes, you never know you might even end up in local pub if you walk far enough! 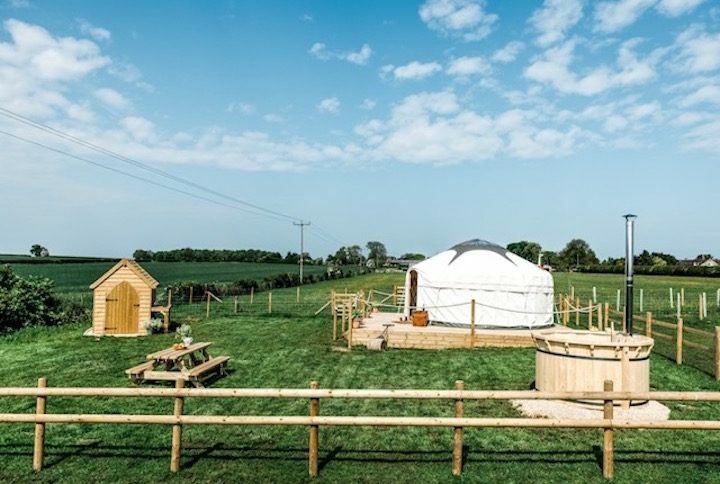 Located in a stunning three-acre Oxfordshire meadow looking out of the ancient White Horse of Uffington in South Oxfordshire, you can take your pick of three separate, stylish and eco-friendly yurts. There’s solar power and recycled furniture aplenty but fear not – the loos flush and there are hot showers (phew). 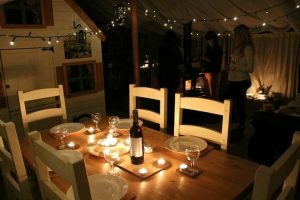 The yurts are all heated, insulated and cozily furnished with cushions, flowers nad lanterns, plus wood burners, and each has its own wooden cabin housing a kitchen, outdoor lounge/bar and covered dining area. 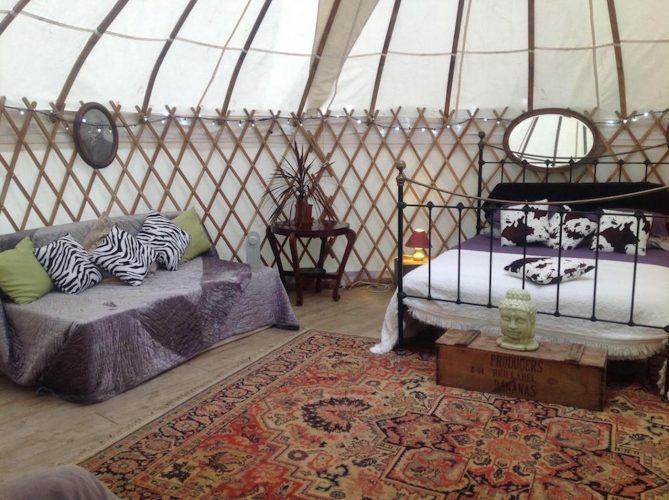 The yurts sleep 8, 12 and 13 – enough for quite a party, don’t you think? 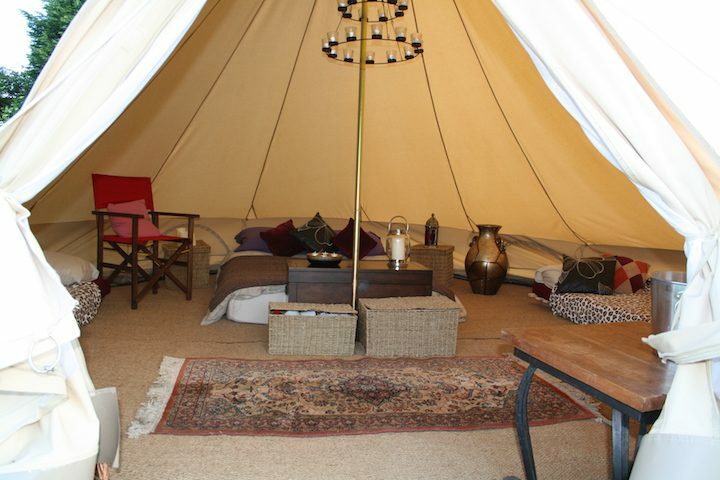 A few more people can be accommodated at each venue with the addition of a tipi or bell tent. Yes, this is an article about camping. This stunning bedroom is just one of the places to lay your head at this luxury, adults-only glamping site on the Somerset, Dorset and Devon border, just 30 mins from the Jurassic coast and walkable to an award-winning gastro-pub. Situated on the edge of woodlands at the foot of a mediaeval castle site, the place is a absolute haven of peace, tranquillity – and comfort. 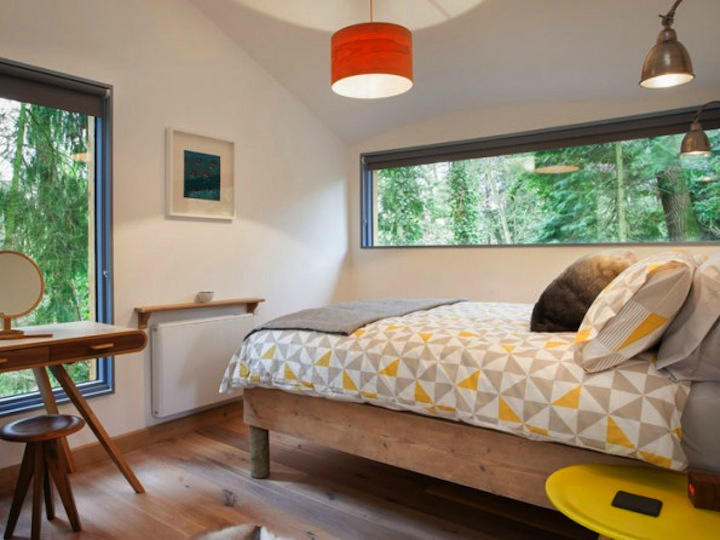 You could be waking up amongst the trees in The Birdhouse, a beautiful stilted wooden tree house for two, with bespoke furniture and sleek modern appliances. Or in one of four Mongolian style yurts sleeping two to four, individually fitted out with vintage and handmade furniture, wood burners and all mod cons: no shared loos or showers here. You can book the entire site if you wish. Chill out on your own, sit under the stars around the fire pit or stroll over to The Lodge where you’ll find a farmhouse kitchen with a huge dining table and a lounge in the roof where you can sit on giant beanbags to chat, read or watch a film. This is my kind of camping. Travellers who like their camping with a large dose of luxury while still keeping it real will love these canvas bell tents on the Springbok Estate in Alfold, Surrey. 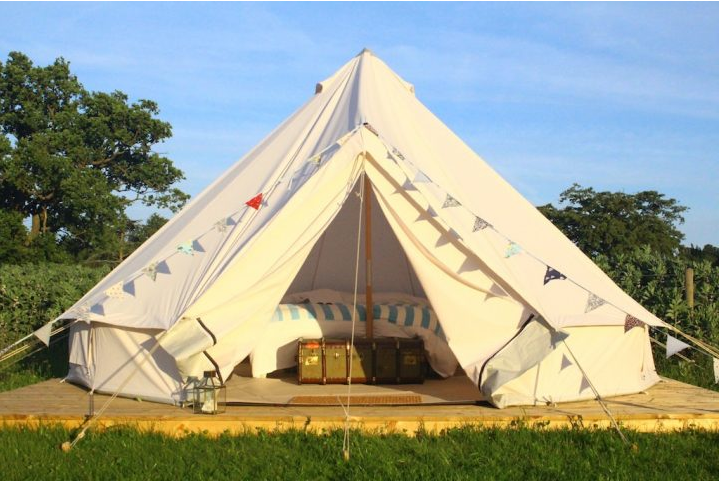 The Glamping Holiday tents come fully kitted out with all the essentials (fully made-up airbeds, towels, lanterns and smart directors’ chairs) along with lots of thoughtful touches like fresh flowers, rugs and bunting. It’s not glamping without bunting! Outside each tent is a picnic table and a firepit. Each tent sleeps up to five, and there are four tents in the one-acre field, plus a fully covered kitchen area (complete with granite worktops and butler sink as well as a gas BBQ). There’s also a toilet/shower block with flushing loos and electric showers – and like the rest of Springbok Estate it’s beautifully styled in subtle shades of Annie Sloane and Farrow and Ball colours. Springbok Estate is close to the Surrey-West Sussex border, between Guildford and Horsham. There’s plenty to do nearby, including fishing (on the estate), walking, cycling and horse riding. 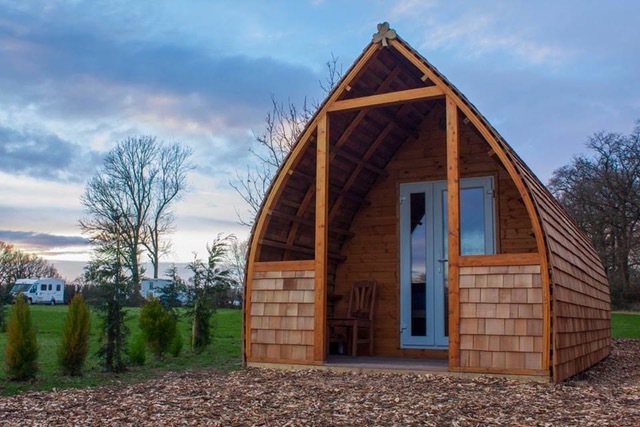 If the thought of sleeping with just canvas separating you from the elements is a camping step too far, the glamping pods at Long Acres in Lingfield might be more your style. There are three pods – Pathfinder, Cedar or Higgledy Piggledy – each with a double bed and bunk beds, so perfect for a family of four. You’ll have to pack your own sheets, duvet and pillow, but each pod has an electric kettle and fridge – so you needn’t go without your morning Earl Grey (and your wine won’t get warm ether, so even better!) Long Acres is a family-run park with 60 pitches on a 10 acre site. The Wire Mill Lake is a 10 minute walk away where you will also find the Muddy award-winning pub The Wire Mill. And the family pooch needn’t miss out, as well-behaved dogs are allowed on the site. This quirky campsite at the foot of the South Downs has lots of appeal for children and some romantic nooks for couples. Each tent pitch is in its own cosy woodland glade with a fire pit. 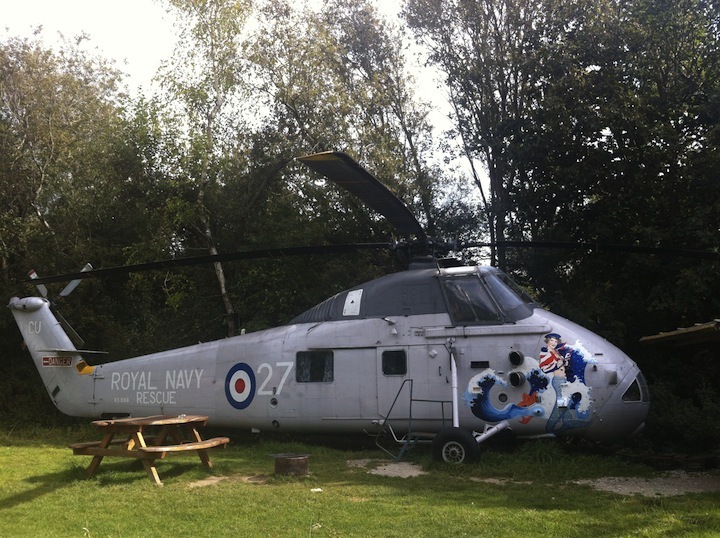 For real fun however, stay in a converted Sixties search and rescue helicopter or double decker bus or a gypsy caravan, ‘curvy cabin’ or treehouse. Some accommodation has bathrooms or kitchens, there are also communal loos, showers and a washing up area. Dogs are allowed on leads. It’s a short hop to a day out in Brighton. You’ll also be given a map showing local walks and good pubs. Underneath ancient oaks in the grounds of Park Farm, on the Warwickshire-Northamptonshire border, these light, airy stylishly decked out shepherd’s huts can only be booked as a pair, as only one has sleeping quarters…The Sung is a beautifully crafted 16ft Blackdown shepherds hut, with elegant double bed and wood-burning stove, it’s a truly romantic hideout, while a sofa can also be converted in to bunk beds to create a comfy family den. Hop, skip and jump a couple of yards to The Hut and you’ll find the practical stuff – the all-mod cons kitchen, dining and living area. It’s the ideal answer to the problem of keeping shepherd’s huts small and traditional while still offering roomy accommodation. Best of all, once the mudlets are all tucked up in their cosy bunks – you can slip next door and pour a glass of vino. Warwickshire may be landlocked but it has a beach! If you’re looking for an action-packed family-friendly water sports holiday head over to the Bosworth Water Trust campsite. 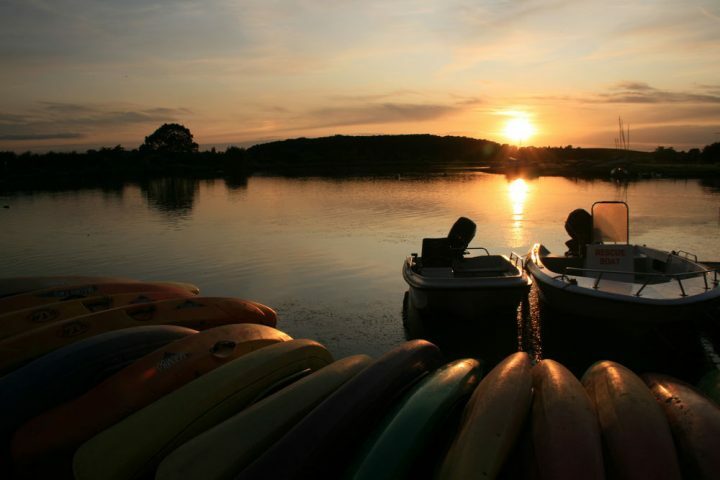 The 50-acres of parkland has 20 acres of lakes and lagoons for boating, fishing, windsurfing, kayaking and canoeing. And you don’t need to splash out on any fancy kit. The campsite will hire out everything you need in the way of tackle and togs, and runs dinghy sailing, windsurfing, canoe, kayaking and powerboating courses. For the less adventurous (or energetic), there’s rowing boats and pedalos, and you can fish from dawn to dusk. A small sandy Blue Lagoon ‘beach’ next to the lake’s roped-off swimming zone should keep younger mudlets happy building sandcastles, and in keeping with the seaside theme the park has a pirate-ship playground, crazy golf, dodgems and bungee jumping. The families-only campsite came 3rd in the Sunday Times’ 2010 camping list, and chosen as the 23rd best campsite in Europe by The Independent in 2006. It has grassed pitches for camping, hard-standing for caravans and motorhomes, plus The Water’s Edge Cafe & Bar.